"Alligator Town Marker, Lake City, FL" by George Lansing Taylor Jr.
Alligator Town Marker, Lake City, FL. This marker is located in the Downtown Courtyard between Madison and Duval Street, in Columbia County, Lake City, Florida.
" 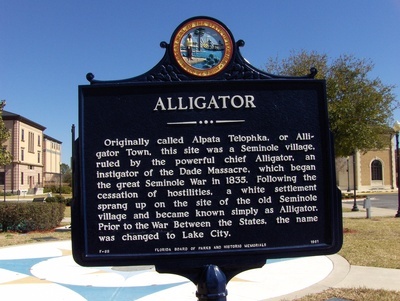 Originally called Alpata Telophka, or Alligator Town, this site was a Seminole village, ruled by the powerful chief Alligator, an instigator of the Dade Massacre, which began the great Seminole War of 1835. Following the cessation of hostilities, a white settlement sprang up on the site of the old Seminole village and became known simply as Alligator. Prior to the War Between the States, the name was changed to Lake City." Taylor, George Lansing, Jr.; Lance Taylor; Photographers -- Florida --Jacksonville; Photograph collections -- Florida -- Jacksonville; Alligator Town Marker; Alligator Town; Alpata Telophka (Alligator Village),Lake City; Seminole town; Columbia County (Fl. ); Lake City (Fl. ); Historical markers ---Florida --- Lake City.